Don’t you love moving into a new home and discovering there are numerous flowering trees and bushes on the property that you didn’t realize? It’s easy to miss these details especially when you move into a home during months when trees and bushes are not in bloom. It’s also easy to miss these details when you are more worried about home inspections, air conditioning units, cracks in the foundation, kitchen appliances etc. Seems like landscaping is an after thought. Rhododendrons are best when planted in the Spring time after the danger of frost has ended. Using correct soil pH for the growing Rhododendron bush is crucial, between 4.5 and 5.5 on the pH scale is appropriate. Unlike many blooming plants, Rhododendron bushes do not like full morning sun in winter and do best when planted in a bit of shade. 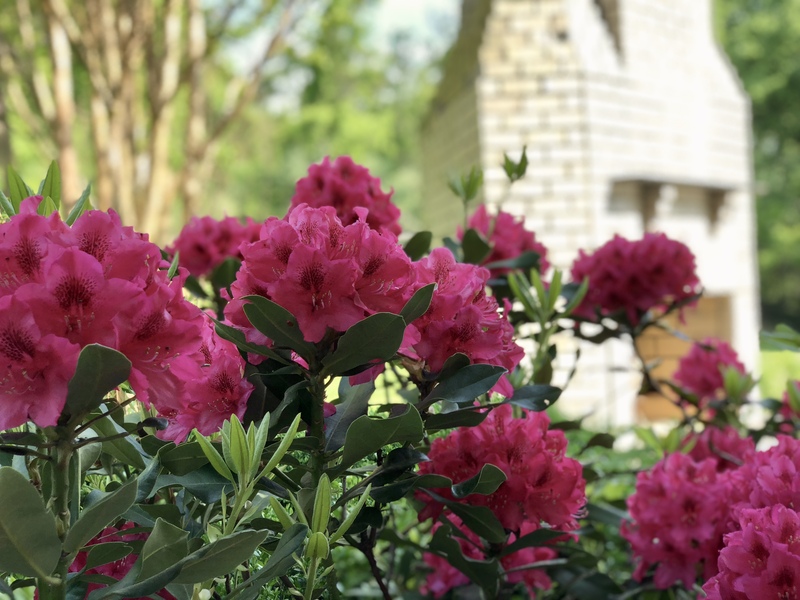 Growing Rhododendrons are also happiest in a location protected from the wind, so choose the location wisely when planning your landscaping. Ours are planted close to the house and fairly protected from the elements. Caring for Rhododendrons will be easier if they are planted is moisture retaining and well-draining fertile soil. Caring for these shrubs is easy. They should be occasionally trimmed and pruned to maintain the shape. Maintenance pruning involves removing the spent flowers and old, dead wood. If allowed to remain, these dead flower clusters can reduce the following year’s flowering. To properly prune, cut near the base of the old flower cluster. Also, remove dead or diseased parts of the shrub, following the branch back to healthy wood and making your cut at that point. Our Rhododendrons bushes are encased in boxwood bushes, which have grown too tall. In the front of the house, we have 5 additional Rhododendron shrubs, also hidden by overgrown bushes. We get to enjoy these pretty shrubs through our dining room window. And cutting a few branches to bring inside is always a good idea. As pretty as the boxwood shrubs and Rhododendron bushes are on our property, we have other bushes in our front yard that are in terrible condition, destroyed by hungry deer. We are embarking on a huge landscaping project in the front and back of our home involving removing bushes and replacing them with deer resistant greenery, flowers and shrubs. In addition, we are adding hardscape and making repairs to existing hardscape. Stay tuned for all the details, I will update you all on our landscaping progress with all the horrific before pictures! For more landscaping inspiration, subscribe to Happy Haute Home and follow along on Pintrest HERE, and Twitter HERE and feel free to pin and tweet your favorite pics from Happy Haute Home. Lovely and in pink my favorite gardening color! Wish I could grow them here but they are hard to get started in Canada so I have been told, but you have inspired me to try a bush…. YAY! I’m so glad. I hope you do grow one and enjoy it as much as I do. They really are a lovely bush and if happy will grow quickly and before you know it they are too tall and too close. I had to remove and replant a few at my daughters house because they were planted too close and were threatening the house. People plant them as small bushes to make the landscape look nice before selling and then before you know it, it is getting very dark in your house. I love them planted away from the house where I can see them from inside. You make an excellent point! With the low maintenance of the shrubs, before you know it..they can become overgrown. I think we will have to relocate ours as well as part of our landscaping project. This project is getting bigger by the minute 🙂 Thank you for visiting. Not sure why, but it took a long time for the rhododendron that I planted on our property to get established. Now it is blooming beautifully! Love it. Your garden is so beautiful. Can’t wait to see what else you do with it! <3 and hugs!! Yes, once they get established, they are truly amazing! And so easy to maintain! 🙂 Hugs Lynn!